Simple, without testing and verfication, a deployment solution will fail. One of the tasks that takes a lot of time to test and verify is BitLocker and that also includes TPM. Windows 10 and Windows Server 2016 gives you the ability to create Virtuial Machines with a Virtual TPM Chip 2.0. 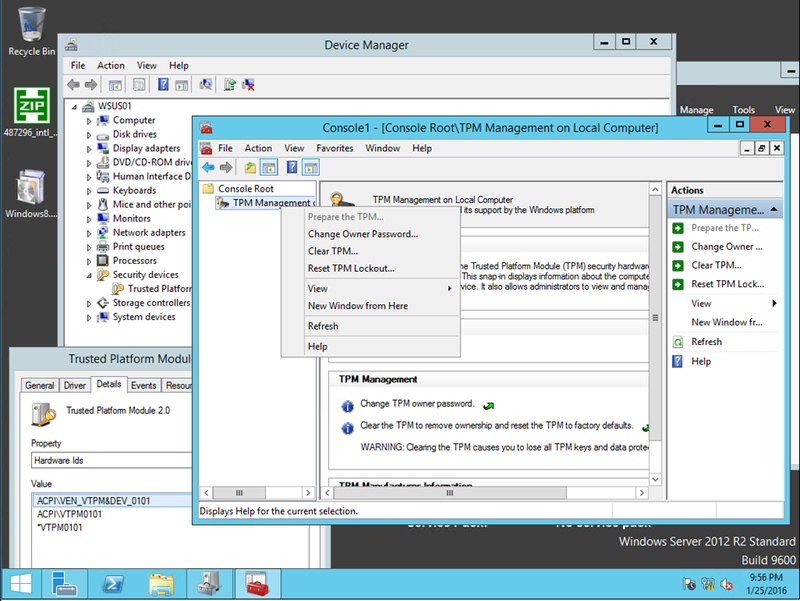 A VM running Windows Server 2012 R2 with a vTPM chip, The VM is running on Windows Server 2016. You need to run Windows Server 2016 TP4 or Windows 10. If needed, restart the host. Before you can enable the vTPM you need to have a Guardian Service guardian object and with that you can crerate a Key Protector. How i install Isolated-UserMode and HostGuardian Feature? What version of Windows 10 are you running and what build? This is great! Just notice that when using Windows 10 Anniversary Isolated User Mode is now included with Hyper-V so you don’t have to install it separately anymore. Running above PowerShell command will just fail. Does this also work at a Microsoft Hyper-V Server 2016 ?